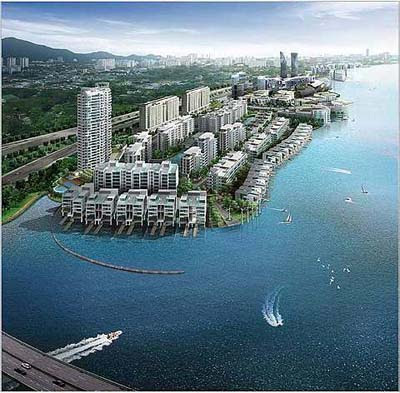 IJM Land Bhd should see a boost in income with the launch of its flagship project, The Light Waterfront Penang, in the third quarter, analysts said. The project has an estimated gross development value (GDV) of RM5.2bil. It has been scheduled for launch in the first quarter but was deferred when the property market softened under the pressure of the global recession. Located on 61.5ha just off the Penang Bridge on the eastern coastline of Penang island, it will be developed in three phases over 12 years. AmResearch said with the launch of The Light project, IJM Land’s three-year earnings compounded annual growth rate would be strong at 49% over financial years ending March 31, 2010 to 2012. “The company’s annual sales are expected to rise from RM750mil in FY10 with the maiden launch of The Light Linear and The Light Point to more than RM1bil in FY11 with the launch of The Light Collection low-rise residences and sea-front bungalows,” it said in a report. The research house’s earnings estimates are underpinned by unbilled sales of RM700mil and sales of IJM Land’s existing projects, including Seremban 2, S2 Heights, Taman Perling and Bandar Utama Sandakan. The freehold integrated waterfront residential and commercial development of The Light will comprise 1,177 residences, including waterfront villas and condominiums. The first phase of the residential series will be The Light Linear, comprising 328 units with built-up from 1,475 to 1,539 sq ft. With prices at around RM400 per sq ft, this phase will have a GDV of RM200mil. The next phase, The Light Point, offers 88 condominium units with built-up from 1,830 to 4,090 sq ft at a GDV of RM100mil. Priced around RM500 per sq ft, or an average of RM1mil a unit, the condos will have sweeping views of the Penang Bridge, the marina and George Town city. Subsequent phases will be The Light Collection with GDV of RM600mil and sea-front bungalows worth RM300mil. According to IJM Land managing director Datuk Soam Heng Choon, The Light represents the company’s initiative to showcase the best in integrated seafront living with residential, entertainment, business and hospitality in one dynamic hub. For the project’s construction, IJM Land will leverage on its parent IJM Corp Bhd’s construction expertise. IJM Corp is a contractor for several high-end condominium projects in the Kuala Lumpur City Centre (KLCC) area such as The Binjai and Commerce Asset’s headquarters in Jalan Raja Laut. In its report, AmResearch said IJM Land had the attributes of a blue-chip proxy to the listed property sector. This is given the potential enlargement of its market capitalisation and gradual improvement in its free float from future placements by parent IJM Corp.
“We understand from management that IJM Corp plans to gradually trim its holding in the property vehicle to 60% from the current 77% to promote greater institutional shareholding,” it said. It added that the move would promote greater trading liquidity in IJM Land’s shares. Also planned for launch in the third quarter is the Nusa Duta development on 127 acres in Iskandar Malaysia, Johor.